This is my youngest daughter's favourite. 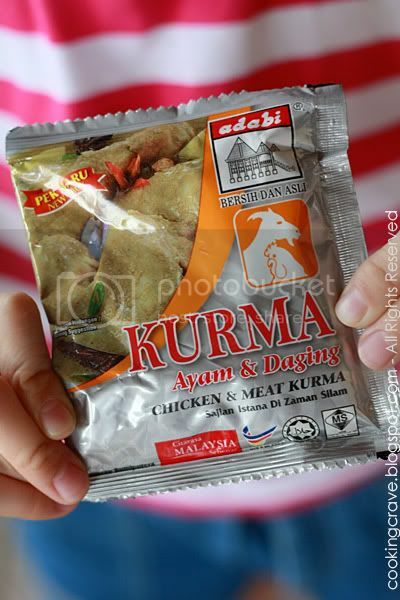 What's the different between this Kurma Chicken with other curry out there? It's more yellowish in colour and it's not hot at all, slightly in the sweet side. With the use of different spices, it taste totally different with the normal curry we always had. My kids just love it with a lots of potatoes and tomatoes. 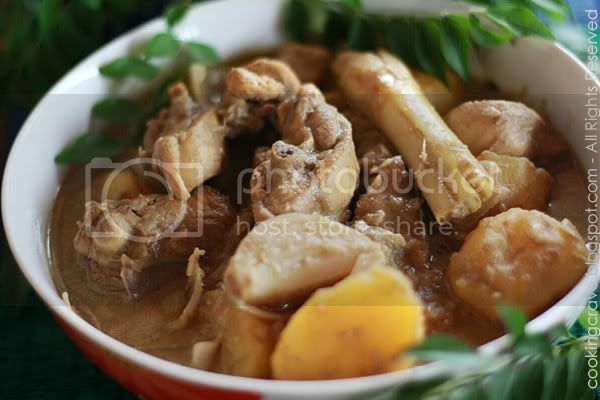 Let me share on how I cook this yummy "Ayam Kurma" here. In a wok, heat some oil. Add in the blended ingredients, lemon grass and cinnamon. Saute until it's fragrant. Add in the chicken pieces, stir to until all the chicken is cover with the paste and change colour, slightly pale. Add in some water and let it cook for a while. Lastly, add in the tomatoes and onions wedges. Stir and let it cook till the tomatoes and onions are cooked. Serve warm with steamed rice or tomato rice. I hope you all can try to cook this at home. A good dish to prepare when there are gatherings or party. Wish you all a wonderful weekend and Happy Cooking ! 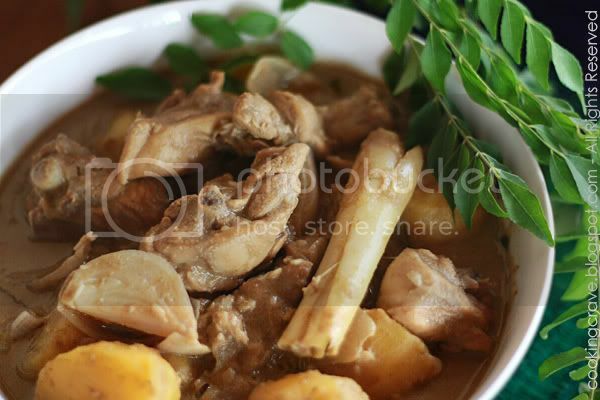 Quickly share the recipe, it look so delicious and tempting, I gonna to try it out. At the same time, i just like to tell you that I have tried out my 1st Chiffon using your recipe and it turn out really great. Just like to say thank you. I'm a mother of 3 lovely kids who enjoyed anything about photography, making new friends, loves to cook nice food, baking & blogging when I'm free. I would love to travel around the world, experience different cultures and food out there. WELCOME TO MY BLOG! Let's Tweet ! ! ! Deep Fried Anchovies - "Ikan Bilis"
Kurma Chicken - "Ayam Kurma"
audrey cooks: Foods Recipe, Cooking, Malaysian. All photographs and written content featured at Cooking Crave are by Amy Ong unless otherwise stated. If you are interested in using the photographs or any part of the contents, please ask for permission first. If you re-post a recipe, please give credit and post a link back to this site. Please do not copy and paste.